If your are looking for a very simple yet tasty sizzling steak, then I think this recipe is the one you are looking for. You only need to marinade it on Worcestershire sauce, MSG and pepper. Then grill it on hot charcoals or a grilling pan on top of a stove. Put it on a hot sizzling plate and garnish it with your favorite garnishing. You can also pour gravy on top but some people don’t like to use gravy so I omitted it. You can but a ready to cook gravy sold on sachet on supermarkets. 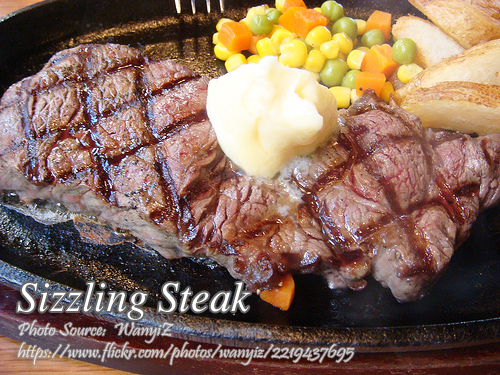 To cook sizzling steak; Marinade that meat for at least half an hour with Worcestershire sauce, MSG and pepper. Grill the steak over hot charcoal. Brush griller with a little oil first before putting on steak. When grilling do not press the meat so as to squeeze out the meat’s juice. Also, brush meat with a little oil before turning to grill on the other side of the meat. Meanwhile, while waiting for the steak to cook, heat the steak’s steel plate on another stove. Arrange garnishing on a platter, so you can immediately transfer steak from the griller to the hot platter. Cut all ligaments on surface. Slice diagonally, 3" thick and slit in middle to make 1½" thick. Pound meat with back of knife or sprinkle with meat tenderizer to make it tender before marinating. You may also use unripe papaya juice as tenderizer. Marinade that meat for at least half an hour with Worcestershire sauce, MSG and pepper. Grill the steak over hot charcoal. Brush griller with a little oil first before putting on steak. When grilling do not press the meat so as to squeeze out the meat's juice. Also, brush meat with a little oil before turning to grill on the other side of the meat. Meanwhile, while waiting for the steak to cook, heat the steak's steel plate on another stove. Arrange garnishing on a platter, so you can immediately transfer steak from the griller to the hot platter. The steak will sizzle when placed on the hot platter. Serve at once.